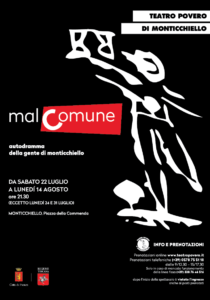 From July 22nd to August 14th, the 51st Autodrama of the Teatro Povero di Monticchiello, “MALCOMUNE” will be on stage. A drama attended by an entire country that questions about crucial issues for the community and where audience can reflect and recognize themselves. The experimental tradition that proposes a new text every year, the performance of the Teatro Povero di Monticchiello is conceived, discussed and played by the actors, under the guidance and direction of Andrea Cresti. Every summer ‘on the square’ in the beautiful village in Orcia Valley. Living together is getting harder. The connective tissue that binds people and lives within a common frame crumbles at every level, between vertiginous inequalities and insinuating fears, crippling ideals and dreams, aspirations and conquests. Walls grow in and out of us, while connections become more and more virtual and secure. An active process on every scale, though small in size, which can also be highlighted more clearly. The Theater 2017 show therefore is a paradoxical situation: one of the rare births that allietates a community as small as it appears in coexistence, alongside an efficient and ruthless technical-administrative simplification project as an algorithm. A plan that will require an individual, family and collective choice without alternatives; useful to signal a steady flow of our nature: the double, paradoxical temptation to recognize and divide, to seek and get away, yesterday as today. With the assiduous, tenacious hope that between one and the other possibility we will still be able to illuminate the future that is waiting for us in some way.